Rudy Mancuso Photos, News, and Videos | Just Jared Jr. It looks like Maia Mitchell and Cierra Ramirez were causing some good trouble at 2019 Coachella Music Festival this weekend! The two Good Trouble stars and producers hit the festival together and shared a ton of cute pics on their Instagrams. Maia, wearing a long blonde wig to the festival, also shared a sweet pic with longtime love, Rudy Mancuso. Cierra is also pictured below at the American Express Platinum House and Card Member Lounge. Check out all the pics below and let us know your fave! Maia Mitchell helped celebrate boyfriend Rudy Mancuso with an epic birthday bash! The couple were spotted partying the night away on Saturday (March 9) at the Doheny Room in West Hollywood, Calif. They were joined by a big group of pals including Maia‘s BFF Cierra Ramirez! The friends enjoyed a VIP table area, where they danced to music from Bee Fowl before Rudy was presented with an over the top custom cake designed to look like a 3-D piano! Gabi DeMartino makes a funny face while arriving with twin sister Niki DeMartino at Spotify’s Best New Artist 2019 event held at Hammer Museum on Thursday night (February 7) in Los Angeles. The two singers and influencers were joined by other social stars and musicians at the event, including Lele Pons, Rudy Mancuso, PRETTYMUCH and Jack & Jack. LaurDIY, Teala Dunn, After movie star Inanna Sarkis and even Luke Benward were also at the bash, which celebrated the Best New Artist nominees for the at the 2019 Grammys. 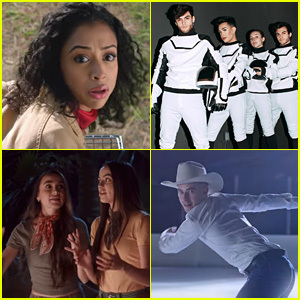 Liza Koshy, a skating cowboy Adam Rippon, Merrell Twins and many more are in YouTube‘s annual 2018 Rewind video that was just released! This year’s video features over 100 of YouTube’s top creators, including Will Smith, LaurDIY, Lele Pons, Rudy Mancuso, Marques Brownlee, James Charles, Casey Neistat, The Dolan Twins, Ninja, Lilly Singh, Emma Chamberlain, Markiplier, Lachlan, WhinderssonNunes, Fischer’s, Noor Stars, Pautips, FAP TV and many more are just some of the stars you’ll see in the video. The video is set to an original music mashup from The Hood Internet and finds all your fave youTubers controlling what the Rewind video will have in it. Cehck out the official video below! Maia Mitchell looks gorgeous in a white gown at the 2018 ALMA Awards held at LA Live on Sunday night (November 4) in Los Angeles. The 25-year-old Good Trouble star was a presenter at the award show, where longtime love Rudy Mancuso performed and was honored at the show with an award. Maia also stuck by young actress Emily Tosta‘s side at the show. If you missed it, Emily will be starring in the upcoming Party of Five reboot on Freeform. Get all the details on JJJ here! FYI: Maia is wearing a The 2nd Skin Co. dress and Le Silla shoes.